However, there are always new problems challenges waiting, and one of these challenges is the use of multiple VPNs simultaneously. I have the following situation: I can only connect to some local network, which does not allow any internet connections. For that purpose, I have to use a VPN "T" -- the VPN server "TServer" (names are only for simplify reading) is more or less the only thing accessible from that internal network. So, every connection to the internet runs through this VPN. Now, I have to connect to a server "S", which only accepts connections from a local network, I call it "FNet". And my VPN server "TServer" is not part of this network "FNet". In order to access this server, I usually start another VPN "F" (with another VPN-server "FServ", virtually placing me (and my machine's IP address) inside the local network "FNet". Unfortunately, I can only connect to "FServ" via the first VPN. So, the question is, how to set up the second VPN? Fortunately, it is possible to simply connect to two VPNs simultaneously. All you need to do is simply to configure both VPNs in your network settings. I can then firstly connect to the VPN "T", and when this connection is establish I can use it to connect to the second VPN "F". 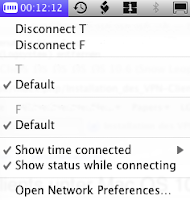 Figure 1 shows the VPN menu in the system menu bar (OS 10.6, with elder versions, things look a bit different, as explained here). It is not that important to know exactly what you see here. The only important thing is the number 111.123.123.144 which is the IP-address assigned to my machine for VPN "T". Within this second VPN, I've got the IP 222.123.123.155. So, I have two interfaces and two IP addresses, one for each VPN. This information can be used to tell applications to connect via one specific VPN. in which "theUser" the user login for "S". 222.123.123.155 is the IP of my machine within FNet (as F virtually places my machine in FNet). Note that you have to use the IP address rather then the name of the server (maybe some geek can tell me how to "update" the DNS stuff accordingly).